What kid doesn't enjoy bouncing a ball around? Similar to the playground game Four Square, this group game helps your child improve his hand-eye coordination and boosts important social skills like group cooperation, teamwork, group problem solving, and compromise. 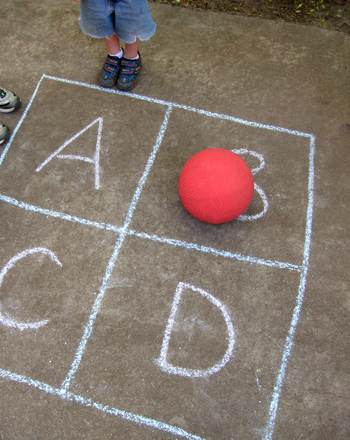 You can play Bounce in the Square on any flat, paved surface with just a bit of sidewalk chalk, a bouncy ball, and at least 4 enthusiastic players. Preparation takes less than two minutes, and the fun lasts all day! To create your playing court, draw a 2 x 2 square grid measuring 8' x 8' on the paved surface with the sidewalk chalk. Draw a large capital "A" in the upper left square, a capital "B" in the upper right square, a capital "C" in the lower right square, and a capital "D" in the lower left square. The player in square A gets the ball first. Each of the squares is ranked, with A being the highest and D being the lowest. The goal of the game is to get to square A and remain there for as long as possible. To begin the game, player A bounces the ball in his square, then serves it to a player in another square by either hitting it lightly with the palm of his hand or gently tossing it. Each time the ball bounces in a player's square, he must hit or catch and toss the ball into another square, making sure the ball bounces only once in his square. If a player catches the ball before it falls in his square, he must bounce it in his square before returning it. Have the players continue hitting and tossing the ball back and forth until one of the players fails to return the ball to an opponent. That player then moves to square D and the players who were behind him move up one square. For example, if player B fails to return the ball, he moves to square D and players C and D move to squares B and C, respectively. If more than 4 children are playing, have those who don't have a square form a line next to the court. When a player fails to return a ball, he moves to the back of the line and the player at the start of the line moves to square D.
Corners: All players run to the farthest corner of their squares. Bus Stop: All players run to cover their letter with one foot. Candlesticks: Player A starts by throwing the ball into the air, claps once, then catches the ball and passes it to player B. Player B then does the same, except he must clap twice instead of once! The action continues around the squares, each subsequent player adding an extra clap. Taxi: All players run to cover their letter with two feet. Titanic: All players kneel on one knee, mimicking the motion of a sinking ship. Introduce your child to a famous block in New York City, Times Square! She'll read a quick blurb about Times Square, and colour the picture however she likes. 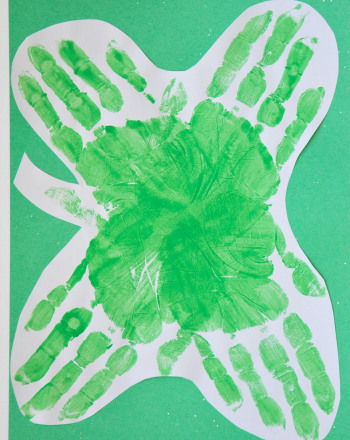 Help your child make a picture of a four-leaf clover this St. Patrick's Day. It's thought that whoever finds a four-leaf clover will enjoy good luck! Let your little weather observer discover the four seasons! She'll match up each season with its proper picture to show her knowledge of how weather changes. Students identify which shapes are divided equally into four quarters. Including four play watches, each showing a time between 2:00 and 2:45, this printable is a simple way to help your child start learning how to tell time. Use these play bills to add excitement and real life context to your maths lessons. Sneak time practise into play time with these bright and colorful play paper watches. Play hopscotch with numbers, but also with letters, to get kids ready for year two reading. If your first grader is having trouble telling time, try incorporating it into his play time with these cool bug-themed play watches. These fun cut-and-wear play watches are sure to liven up pretend play as they boost your first grader's time telling skills. With bright colors and cute patterns, these play watches make fun accessories for pretend play and help kids get acquainted with analog time.